Click the Numbering button, next to the Bullets button on the Home tab. 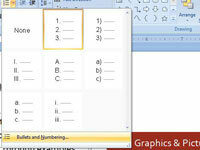 When you click the Numbering button, PowerPoint adds simple numbers to the selected paragraphs. But you can change the format. Click the Numbering button arrow. A list of number style choices displays. 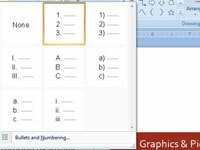 For more options, choose Bullets and Numbering. 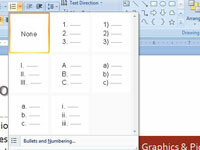 The Numbered tab of the Bullets and Numbering dialog box opens.